Another kitchen success story! I am really on a roll these days. 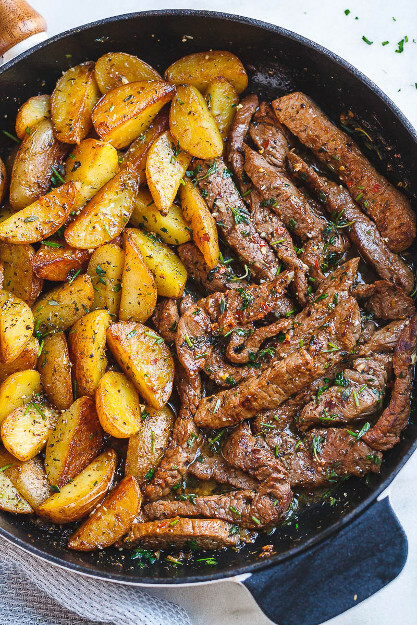 I got this recipe from Eatwell 101, where it’s called “Garlic Butter Steak and Potatoes Skillet”, because you cook the entire meal in a single skillet. A big single skillet. The lighting in my kitchen makes for lousy photographs, so here’s an image I grabbed from the website. Like so many good things in life, it all begins with a marinade. This one was made with soy sauce, olive oil, Sriracha, and cracked pepper. Gonna be hot stuff. I cut flank steak into strips and marinated them overnight. The next day, I heated olive oil and butter in the skillet and cooked quartered baby yellow potatoes for about five minutes on each side. When they were golden, I shifted them to a platter and made a quick run to my building’s roof deck, where I clipped some thyme, rosemary, and oregano from our little communal herb garden. Can’t get much more fresh, seasonal, and local than that. The herbs went into the skillet, along with more butter, some crushed garlic, and red chili pepper flakes. I added strips of flank steak, and, after they had browned, I poured the reserved marinade into the pan. The only thing left to do was return the potatoes to the skillet for reheating, and sprinkling more of those very fresh herbs over the pan. The meal looked and tasted great, and clean-up was in cinch. 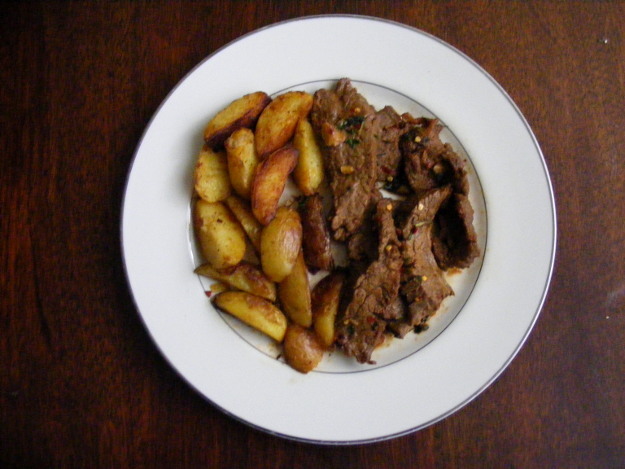 This entry was posted in 2018 Cookery Project, Home Meals and tagged Eatwell 101, Garlic Butter Steak on 18 June 2018 by bcarter3.